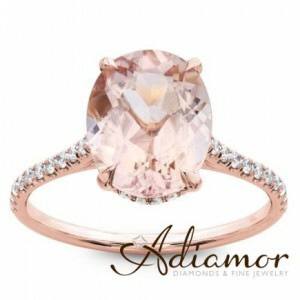 Here at Adiamor we were honored to be able to design a gorgeous oval cut morganite engagement ring, which has a band of French cut pave diamonds, to one special couple who was featured on the new show “Marry Me Today”. The show premiered recently on the FYI network and followed an unsuspecting bride-to-be, Jolie, who thinks that she has entered and won a contest on The Knot for having “America’s Most Romantic Boyfriend”. Last Year Jolie’s mother passed away, and when asked why Brandon is the love of her life she says that he took time out to really get to know her mom before she passed. “How do you get a guy that sweet” she says through tears. She is so surprised when she finds out that her boyfriend Brandon has not only turned the tables and planned a proposal, with a custom designed Adiamor oval cut morganite engagement ring, but also planned an entire wedding in only one week with the help of style expert Lilliana Vasquez. The custom oval cut morganite engagement ring that was created especially for Jolie was designed with ideas from her inspiration board on The Knot, and Brandon also kept Jolie’s mother’s ring in mind when customizing her rings. The end product is an 18K rose gold engagement ring with an 8-9mm oval cut Morganite it has a 1.5mm wide band that has 0.25cttw of diamonds in French cut pave. The wedding band is also an 18K rose gold custom ring and is a French cut and bezel set eternity band with 0.62cttw of round diamonds. The rings pair together beautifully. 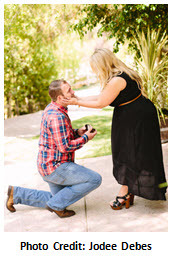 We want to wish Jolie and Brandon a lifetime of happiness!